I have not posted a project in quite a while. Life has been very busy and most of my shop time has been limited. I’m slowly revising the shop, so project time has been limited. I actually started this project last Christmas. My wife is a musician (drums, keyboards, bass guitar), but we don’t have space for a drum kit in her small studio. 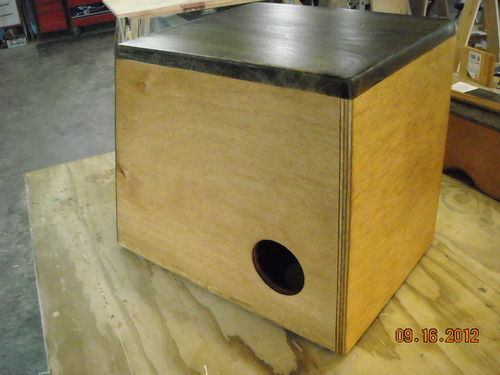 I’ve been wanting to make a cajon, similar to the one by Steve Ramsey (Woodworking for Mere Mortals). 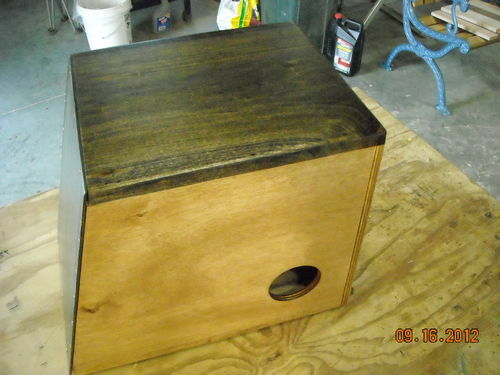 I built the plywood cajon on the left first and surprised my wife with that and some Vader brushes. She loved it. :) It has really good tone and the adjustable snare means that she gets a good snare sound near the top, plus a nice Tom sound toward the bottom, plus a variety of percussion sounds. But, there was no Crash and no good Bass drum kick. So, we brainstormed a bit and added a stand with a cymbal for a Crash. Then we experimented a bit with some boxes and microphone connected to her bass amplifier. Thus, the second, slightly smaller box was born. It’s a solid box, with no sound hole. But, it has a microphone mounted in the middle of the box, with a small hole for the cord in back. It doesn’t take much amplification at all to create a nice bass kick sound. We added a chain-drive bass pedal that attaches to a T-plate screwed to the bottom of the bass drum box. Finally, she found the perfect cajon cushion at Guitar Center for more comfort. She sits on the cajon and uses her hand to play the Snare, Tom and Crash sounds. She uses the foot pedal to play the Kick drum. So, she has a pretty good basic drum kit. 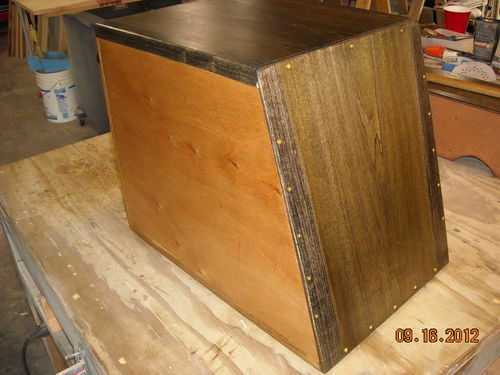 The bass drum box stacks on the cajon and the bass pedal sits on top of that. So, it takes up a really small footprint in the corner of her little sound studio when she’s not playing it. It’s light and easy to set up when she wants to play. Down the road, we could add a Hi-Hat to round out the kit. In addition, she can just play the cajon by itself as the percussion instrument it was meant to be. So, she has the best of both worlds. Thanks for looking. All comments are welcome. Once we worked everything out, I finished everything with wipe-on Poly. Never seen anything like it, but would love to hear it played. 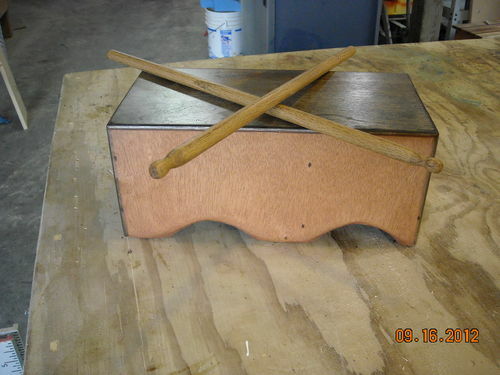 If you search on YouTube for “cajon” or “cajon lessons”, you’ll get a good idea of what the instrument sounds like. Back in 10aSEE when I worked at the big orange box store, there was a fellow worker who I knew played drums with a “nightclub band”. One day I saw an old beach bingo movie where some surfer dude was playing the bongos. So just for the heck of it I made my own version and gave it to my buddy and he loved it. He asked if I’d ever heard of a Cajon. He explained what it was and I was intrigued. So I did a bit of research on the Internet and found a bunch of info. 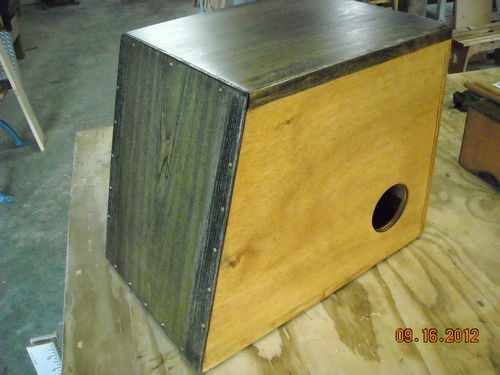 The 3 sides and the base are birch plywood and the seat and “head” are poplar. I ran the head thru my planer till it was almost paper thin. I mounted the head with small brass screws so it could be easily replaced in case it ever cracks or gets damaged. It’s been a BUNCH of years since I played drums, but I thought it had a pretty nice sound to it. It’s hard to see in the pics, but the head and seat are book-matched. He said several of his friends wanted me to make them each one but that all happened at the same time I “unexpectedly left” my employ with HD, so I never did make any more of them. 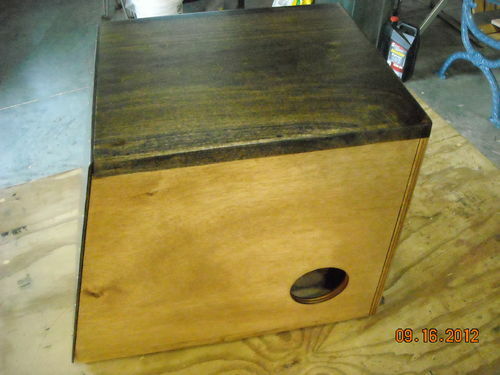 The heads on my cajon and bass drum are also attached with screws to allow them to be replaced, or adjusted for tone. Thanks for sharing your pictures and journey!